A lot has been explained about Nanotechnology and its various researches in CircuitsToday.com. In a study in ACS’s journal Scientists, another major advancement of Nanotechnology has been explained. According to the study, a new self-powered nano-device has been developed which has the ability to transmit data in wireless mode at very long distances. The device can be made feasible enough for developing various other devices like sensors that can be planted inside the human body, airborne and stationary cameras for surveillance, and also smaller personal electronic gadgets than the existing ones. All these devices will operate independently from external power like battery or environmental energy. Since they are nano-devices, the amount of energy required for their working is less. And this small amount of energy can be harvested from the pulse of a blood vessel, a small breeze, or even from a personâ€™s movement. Different sources from the environment like solar energy, a part of a strong wind, vibrational energy, sonic wave, and also thermal energy can be converted to the energy required for the nano-device. 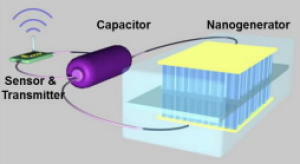 As shown in the figure, the device has a nano-generator that converts either one of the above derived energy to a small amount that is enough for the device to function properly. This energy will be stored in a capacitor and a sensor and radio transmitter is used to pass the signal wirelessly, similar to the working of a Bluetooth enabled mobile headset. When the device transmits wireless signals, it could be easily detected by an ordinary commercial radio at distances of more than 30 feet. The developers have funding from various agencies like Defense Advanced Research Projects Agency (DARPA), U.S. Department of Energy, and also Basic Energy Sciences. Amazing I hope the products based on this technology soon available for human being. Thanks for this information.